A man from Thane's Naupada district surely made headlines with his recent stunt, wherein he took a rather unconventional route to get his pre-ordered iPhone X. Sitting on a horse and holding a placard that read, "I love iPhone X," he had a procession and a band party follow him to the store. According to reports, Pallival, went riding a horse with a procession and a band party to receive his iPhone X at 6:30 pm at Thane's Hariniwas circle yesterday. 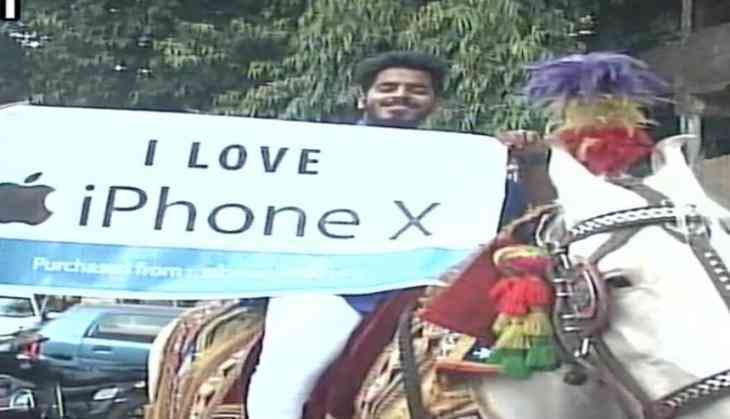 He even received his brand new iPhone X while sitting on the horse by the store owner Ashish Thakker. It was a lucky day for Pallival as he became a proud owner of a brand new latest iPhone X and was also happy getting the publicity. The iPhone X marks as an important milestone in the history of Apple. Meanwhile, the iPhone X - pronounced as iPhone ten -- exists to commemorate ten years of the iPhone. iPhone X starts from Rs 89,000 and goes all the way up to Rs 102,000.